1. Open to all youth ages 5-18 years old. 2. 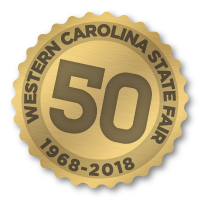 All pullets must be on the Western Carolina State Fair Grounds no later than 5:45pm. 3. Pullet show will begin promptly at 6:00pm. 4. All pullets must be pullorum tested before they can be brought onto the fairgrounds (please make arrangements to have this done before the day of the show). Any bird not tested will not be allowed to show. 5. Exhibitors must bring their own cages, feed, and water containers for their pullets. 7. All exhibitors must pay a $5.00 entry fee per participant. 8. Each exhibitor will receive one gate admission ticket for themselves, and one extra. Additional tickets may be purchased in advance on the entry form for $6 or on the day of the show for $8. 9. The registration forms must be postmarked by Monday, October 15th and mailed to the Aiken County Clemson Extension Office. Any forms postmarked after October 15th will have a $25 late fee added. 10. The show coordinators reserve the right to make decisions concerning or changing rules, regulations, and/or health requirements. Any animal exhibiting any significant symptoms of disease or sickness will not be unloaded from the vehicle and is not allowed to remain on the fair grounds.